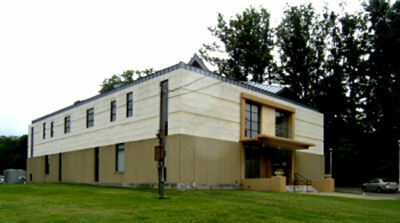 The building shown at the left is in Lyndhurst, Ohio, on the north side of Cedar Road, between Green and Richmond Roads. It was dedicated as Cedar Sinai Synagogue in 2011, the new home of Warrensville Center Synagogue - Kehillat Yaakov, which had been located on Warrensville Center Road, south of Mayfield Road. 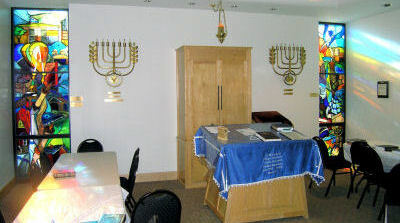 In July 2012 some members of Taylor Road Synagogue joined Cedar Sinai Synagogue, which then adopted a new name "Oheb Zedek Cedar Sinai Synagogue". The two congregations have not merged however. Though the outside of this building is simple, its interior is splendid. The lower picture at the left shows the chapel in the early morning light. The two stained glass windows in the chapel tell the history of the synagogue and its times. The window at the right, titled Immigration Window, donated by Lester Tavens and family, is dedicated to the memory of Rabbi Israel Porath and Rabbi David Genuth. The window is shown below, with an explanation of its design and information on the artist. Rabbi Israel Porath led the Oheb Zedek and N'vai Zedek congregations, which live on in the history of this shul. During his years as "dean" of Cleveland's Orthodox rabbis he did much to further unity and community. Thus it is specially appropriate that he be remembered here, in a congregation that describes itself as "The Modern Orthodox Shul for Unity and Community." The old country. Europe with small houses, broken menorah, sword, whip etc. There also is the yellow star "Jude" that Hitler's Germany forced Jews to wear. The ship, its passenger manifest and Ellis Island are next. Above are people shlepping their pekelech (packages) and the Statue of Liberty. There is the symbol of Menorah Park, the front page of Die Yiddishe Velt (Cleveland's main Yiddish language newspaper for more than 40 years), The Temple (Tifereth Israel on East 55th Street) and the old Scovill Avenue home of Ohel Jacob. Next is the Jewish Orphan Home, forerunner to Bellefaire, and the old Montefiore home. Left of the torch is a horse and cart (Jacob Saperstein's cart from which American Greetings would grow) and the old Warrensville Center Road shul. To the right is the symbol of B'nai B'rith and the Hebrew Cultural Gardens. Views of the new Cedar Sinai building are shown. At the very top are the flag of the State of Israel and the words "Cleveland Jewish News". Barak Uranovsky was born in Cape Town, South Africa in 1972 to an artistic family, Barak’s father Meyer is an acclaimed painter, his mother a fabric artist, his brother an architect, and his sisters musicians. Barak studied art at school and did an apprenticeship with David Manning, one of South Africa’s leading stained-glass artists. He came to Israel in 1990 for a year in Yeshiva but ended up enlisting in the IDF the next year, combining Torah study and military service in the “Hesder” framework until 1995, when he was discharged from the army. Thanks to Lester Tavens for the description of the window, the image, and the information on the artist, which first appeared in a Cedar Sinai Newsletter. Our pages on Sam and Minnie Klausner tell of the Tetiever Congregation, which built its first shul on East 40th Street (1914), then Linn Drive in Glenville (1926) and then the Warrensville Center Synagogue (1957). For more stained glass windows on these pages see the Tiffany Windows at the old Euclid Avenue Temple, and the Arthur Szyk windows at The Temple at University Circle. To visit the website of Oheb Zedek Cedar Sinai Synagogue, click here.